To land your next position as a restaurant general manager, you first need to list your past work in restaurants and bars and all managerial experience in a compelling resume. 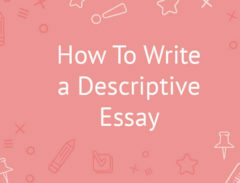 Start with a summary that introduces your background and specialties in a few concise sentences. List all relevant bar and restaurant experience, emphasizing your leadership roles in each position. Be sure to highlight your special skills as well, such as experience with staff training and development, stellar customer service skills and experience with marketing and publicity. 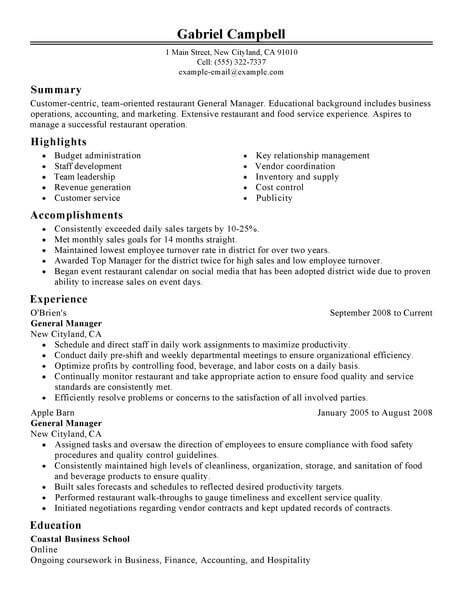 Use our general manager resume example for more inspiration as you build your new resume. To be a successful restaurant general manager, you’ll need experience in the restaurant business, managerial skills, and a compelling resume. 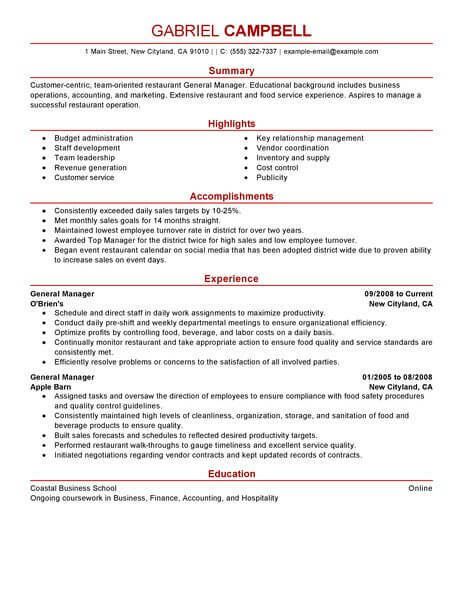 The resume examples below can be a handy guide to help you create your restaurant general manager resume, or make it better. We have multiple template designs to choose from, making it easy to customize your resume to fit your needs. 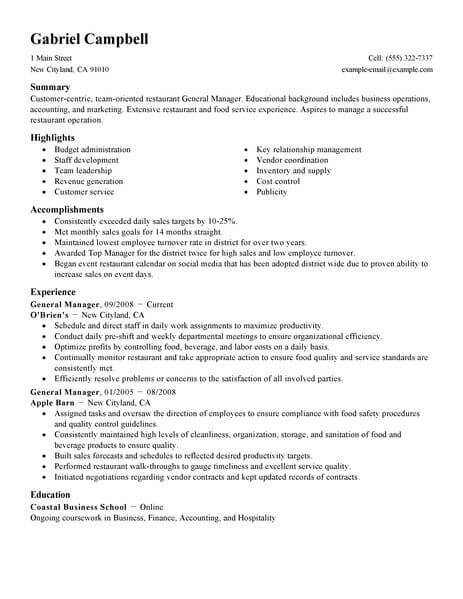 Click on the resume examples below and take the next step toward managing a restaurant! 1. Turn to your network. Talk to people in your network to find out about job opportunities, get in touch with hiring managers and learn more about the job market through informational interviews. 2. Do some leg work. In order to successfully find a job, you have to do some work before you start. Figure out what sort of positions you want to apply for. Do some research regarding the job market, resume writing and the interview process. Come up with an organizational plan. Properly preparing before you start can make a huge difference in your search. 3. Be persistent. Because the process can take so long, it is easy for jobseekers to stop following up on leads. Make sure to always communicate with potential employers until you get a definitive answer about the job in question. 4. Use the Internet. There are a lot of tools available to you online. You can look at job positing sites and company websites to find out about opportunities. You can use social media to connect to potential employers. You can even use online interview and resume writing guides. 5. Really consider your options. Many people looking for jobs as a general manager forget to consider all of their options. You can either get a similar job in the same industry, get a different job in the same industry, get a similar job in a different industry or get a different job in different industry. Consider your skills and what you like to do as you try to decide which of these options is best for you. 1. Focus on the reader by including information that is important to the employer, such as your past experience, the skills you have and the personality traits that make you right for the job. 2. 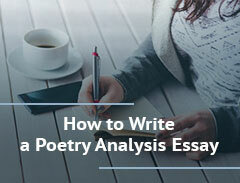 Create a reader-friendly document by focusing on format, using headers, keeping the text flushed to the left and using no more than two different fonts. 3. Discuss your experience in terms of accomplishments rather than day-to-day duties to keep it from sounding like a job description. 4. Include plenty of contact information, such as a website, the city and state you live in, a phone number and an email address. 5. Include metrics when possible to help set yourself apart from other candidates and give the hiring manager an easy way to compare you to your peers.